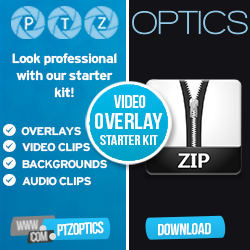 Free eBook from PTZOptics now includes 10+ free live streaming courses! Subscribe to our YouTube Channel and stay up to date with our latest announcements! Download our Video Overlay Starter Kit with some great ideas for spicing up your next live stream! This eBook is updated and maintained by a slew of audio visual experts from PTZOptics including: Paul Richards, Joseph Mulcahy, Matthew Davis and Patrick Kirby. NEW: Also included "Tips from 7 Industry Pros" including experts from vMix, Wirecast, Streaming Idiots, VideoGuys and DACAST! BONUS: Did you know we are now offering 10+ unique live streaming courses absolutely free! We want you to succeed with live streaming and video production! Get the free download coupons included with eBook! 7,500 video views per day... is the equivalent to work done by 46 hyper efficient sales reps, educating customers on the product.